You are the person who has plenty of various hobbies. You want to become rich and successful. You are a great and ambitious personality. We are looking for you! TemplateMonster team created a unique Private Marathon for people who want to make money on the Internet. We are going to speak about different social networks, SMM managing and YouTube. All the secrets how to create, edit, promote and make money using all the cases, which we will tell you about. If you are keen on writing, making different creative projects, videos and other things – you are on the right way! To start working on the Internet is not so difficult as it seems to be. TemplateMonster wants to offer you a special tool which will help you to understand what exactly you need. It is a special step-by-step guide which was written by one of the professionals from TemplateMonster team. It is not just a simple book. It is a perfect thing for those people who have even no idea about Internet and making money on it. All the peculiarities and details are described and explained. This will be an ideal point for you to start. While you are reading you must find the subject you are interested in. Ready? Now it’s time to sign up for the first Private Marathon “Make Your First $500 Online”. The link on it you will find in the end of the book. Be one of the best ones! With the help of your personal mentor it will be really easy to complete all the practical tasks of the Marathon. He will be your second mum for 10 weeks. All the questions and misunderstandings you can clarify with him. You must remeber that this project is made only for best people. That`s why after registration you must answer several questions. All the answers you can easily find in the step-by-step guide “Make Your First $500 Online”. What`s also really important is that the places in the Marathon are limited. That`s why it is principal to remember that you must not lose your chance! Well done! You are the champ! The most delicious thing in this aspect is the fact that the winner of the Marathon will get the valuable prize. What is it going to be, only the best one will know. Make sure that all your goals are really important for you. You are the person who wants to become a new millionaire. Your dream is so close to you. Just reach out your hand and grab your luck and fame! Joomla Quiz Deluxe offers an easy way to create quizzes with the variety of different settings. The extension has a vast functionality with an opportunity of establishing full learning courses. Joomla Quiz Deluxe includes a wide range of question types (10 basic + 4 puzzle question available in Expert version), modes and styles and allows you to insert video and audio into questions. Question Pool option will let you create quizzes with random questions pulled from certain question categories. A website, whether it’s business or personal, is a way to tell the world who you are. From bloggers to small businesses to big corporations use websites as an online introduction of themselves, their services and products to potential followers or clients. The design can reflect ideals and as such, shape perceptions. And the good news is that with online resources to guide people through the process these days, it’s not always necessary to hire a graphic designer to create a quality website. A picture, as they say, is worth a thousand words. Many in business, publishing and social media would agree that there’s validity to the idiom. Newspaper people, for example, know that graphic elements added to stories and advertisements increase interest. We all know the old adage – a picture says a thousand words. And if you do the math, it’s easy to figure out that videos are worth that much more! Media has revolutionized the web – it has revamped the way we think about content, opened up new opportunities in sharing web content, and is reinventing the way we think about web journalism. The bottom line is that media on the web has never been so important, even for small and medium-sized websites. Have you ever stopped to think how media improves your WordPress website’s content? It’s time to stop thinking of media, in particularly pictures, as descriptive items whose main goal is to decorate your website. With tens, or even hundreds of websites trying to paraphrase the same content you are trying to push out, media offers novel ways of distributing content. Image thumbnails offers an insight into articles, whereas video journalism makes the article an interactive process. And in spite of this, a glaring drawback is ever-present with popular content management websites and blogging tools, including WordPress – media management. There’s no better time to start learning digital design than right now. It’s easier than ever to sell website templates, design premium iconsets, or teach digital painting on sites like Gumroad. And if you don’t have the necessary skills for any of these tasks you’re in luck! The Internet makes it much easier to teach yourself with bountiful learning resources and freebies at your disposal. In this post I’d like to share my favorite websites and resources to help aspiring artists & designers master their chosen skillset. Most digital design work can blend into digital art and vice-versa. So no matter what you’re trying to learn just remember you have a growing community of designers and artists online every day willing to share tips and advice to help you improve. There are many types of icons from simple flat icons to detailed app icons. You can learn all of these styles, but to get into more detailed icon techniques you’ll need to start with the basics first. This often relates to design principles such as lighting and perspective. These are not easy to learn but if you study basic art fundamentals it’ll make your job easier. Now studying is always great, but understanding icon design is best done through practice. I recommend starting with pencil sketches to improve your skills. You don’t need to be amazing at art but you should be comfortable enough to put your icon ideas onto paper. Work to build a consistent habit of sketching to get yourself comfortable drawing each one of your icon designs before opening Photoshop or Illustrator. Once you have this down you’ll want to pick a style and work to master it. This can involve line icons or flat icons or anything similar. When you get into more technical concepts you can even do realistic icons if you have the temerity. The best icon designers study art fundamentals and know how to put these to good use. Don’t let any of this scare you off the path. Just be willing to keep trying and learn from your mistakes along the way. To get started with basic icon designs check out the TutsPlus icons category. Backlinks are considered one of the most highly rated aspect of Google’s algorithm to calculate page rankings for a user’s search query. This has placed enormous stress on SEO services to provide webpages services to increase their rankings. They play a central role as rankings factors for Search Engine Result Page (SERP), which elevates their status in deciding webpage success and traffic. However, there are certain rules when it comes down to link building and overstepping them will result in penalization. Link building campaigns require time, monetary resources and expertise for long term effects and successful implementation. When it comes to plumbing repairs, you can’t do without experienced professionals. How to find such skilled masters in a quick way? The answer is: “On the Internet”. Really, each serious plumbing agency needs and has its own website. If you are an owner of such company, you can create a website easy using finished web design product – a website template. Well, how to choose the appropriate one? 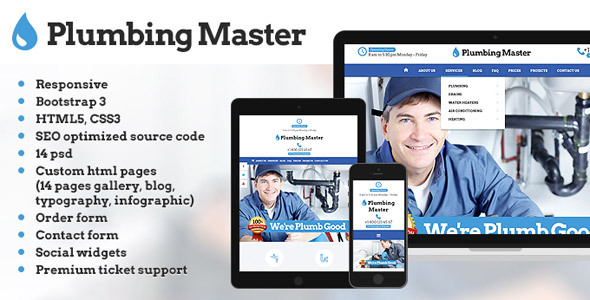 Below you can find some characteristics of 9 website templates for plumbers you can consider to use. We can take them simply from Google’s search results for “Plumbing website templates”. Promoting the blog across digital windows is as challenging as it gets. Amateur bloggers mistakenly believe it’d be easy. The Internet is littered with blogs. Why should someone come to your blog instead of another’s? Remember, creating a website and setting up a blog takes only few minutes. The real difficulty starts with promoting it. Blog promotion is all about giving readers the reasons to come and visit your blog and stay there for long. But most bloggers fail to pull it off. As a result, they couldn’t grow their blog’s reader-base or monetize it. On your way to the senior programmerposition at a major company, you are about to get tons of experience and knowledge. Where should you get these crucial things? The first thing that comes to mind is go to some courses and study coding in the classroom, or even get a university degree. Nevertheless, it’s not that simple – technologies are developing and upgrading at the speed of light, leaving the educational programs far behind. Definitely, you will get some basic knowledge in the classroom, but it will take some time and money. Good news: you don’t have to do it. Did you know that most programmers are self-educated? In fact, almost everything you need to learn can be found online. Ebooks, online courses, tutorials and other materials are ready to help you accomplish your resolution with less time and effort! The only thing you have to do is enjoy the education process – otherwise it will not be productive at all. Your learning process should involve communication. Luckily, programmers are friendly people, passionate about what they do.And they’re always ready to help you! Join IT communities and take part in online conferences and webinars to get the answers you need. Within these communities you can also find valuable connections and maybe even job offers!